To undertake construction work (including footpath landscaping) within or adjacent to a Council road reserve, you must first seek Council approval. Note: this process does not apply to authorised utility service providers (Telstra, Essential Energy, etc). 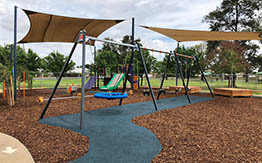 All construction activities (apart from footpath landscaping - see below) that occur within or immediately adjacent to a Council road reserve must be undertaken by contractors accredited by Council. You must pay a Road Restoration Fee and/or securities bond prior to the start of works (where applicable). Contractors are able to apply for accreditation at any time. Those wishing to be accredited must apply to Council via the Contractor Accreditation application form. Should the application be approved, the contractor must then sign an agreement to comply with a list of standard conditions. Council may permit a footpath “landscaping” activity to be undertaken by an individual (or their subcontractor) if the individual owns the adjacent property or has consent from the owner of the adjacent property. It provides residents with landscaping options. Should an application be approved, the applicant must agree to keep the footpath landscaping work well maintained and in safe condition at all times. Any pruning, removal or relocation of an existing footpath tree (or its roots) must only be carried out in consultation with and under the direction of Council’s Manager Horticultural Services Ian McAlister - phone 6801 4000.